When Saints, Scholars, and Schizophrenics was published twenty years ago, it became an instant classic—a beautifully written study tracing the social disintegration of "Ballybran," a small village on the Dingle Peninsula in Ireland. 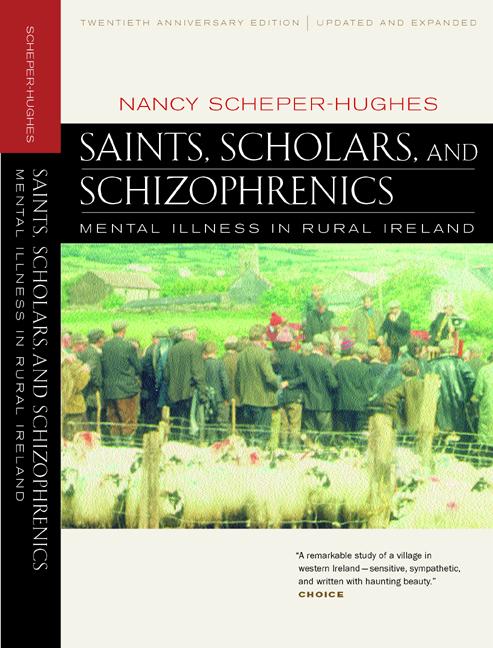 In this richly detailed and sympathetic book, Nancy Scheper-Hughes explores the symptoms of the community's decline: emigration, malaise, unwanted celibacy, damaging patterns of childrearing, fear of intimacy, suicide, and schizophrenia. Following a recent return to "Ballybran," Scheper-Hughes reflects in a new preface and epilogue on the well-being of the community and on her attempts to reconcile her responsibility to honest ethnography with respect for the people who shared their homes and their secrets with her. Nancy Scheper-Hughes is Professor in the Department of Anthropology and Director of the doctoral program in Medical Anthropology at the University of California, Berkeley. Her many publications include two books published by California, the award-winning Death without Weeping (1992) and Small Wars (1998).